The West Michigan Prosperity Alliance (WMPA) was created in 2013 as part of Governor Snyder’s Regional Prosperity Initiative. The governor identified 10 prosperity regions across the state, the WMPA is also known as Region 4. The purpose of the initiative is to increase communication and collaboration as well as better coordinate and integrate investments around economic development, workforce development, and infrastructure. As of October 1, 2018, WMSRDC assumed fiduciary leadership of the West Michigan Prosperity Alliance (WMPA) Regional Prosperity Initiative (RPI) Region 4. In addition, Erin Kuhn, WMSRDC executive director will serve as chair of the WMPA steering committee. In December 2018, the State of Michigan announced Fiscal Year 2019 RPI funding including $306,810 for the West Michigan Prosperity Alliance. This is the largest RPI grant award Region 4 has received to date, and includes a $70,000 award for integrated asset management. This one-time grant award requires the Region to work with the newly formed Michigan Infrastructure Council to coordinate two regional communication and coordination summits, and work toward the development and implementation of a statewide asset management program through collaboration and coordination with the Transportation Asset Management Council, Water Asset Management Council, and the Michigan Infrastructure Council. The remaining $236,810 of the grant dollars will be utilized to continue the ongoing efforts of the West Michigan Prosperity Alliance including the funding of regional propriety projects. 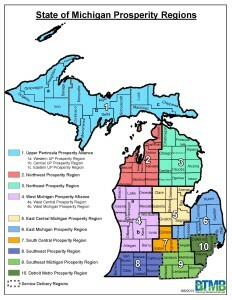 The WMPA, also known as RPI Region 4, encompasses 13 counties in West Michigan covering a total of 8,163 square miles, equivalent to the State of New Jersey. The region also includes 130 miles of Lake Michigan shoreline and a population of over 1.5 million people. The 35 member WMPA steering committee includes representatives from a variety of sectors including regional planning, metropolitan transportation planning, adult education, workforce development, economic development, higher education, and philanthropic agencies. Over the past six years, the WMPA was led by the Grand Valley Metro Council A(GVMC) and chaired by John Weiss, the GVMC executive director. During those six years the WMPA worked together to organize, build trust, and increase collaboration across the 13 county region. These efforts have received recognition for providing leadership within the region and serving as a model for other regions in the state. The WMPA was the first to develop a public process to share RPI funding and award projects. This process included organizing a public meeting that determined evaluation criteria. The process established a public voting procedure and invested almost one million dollars in the region over two rounds of funding and involved hundreds of people. WMSRDC would like to thank the Grand Valley Metro Council and John Weiss for the leadership provided to the WMPA since its inception. Over the past six years, WMSRDC and Erin Kuhn have been active partners in the WMPA and look forward to leading the effort into the future and build upon its past successes.